Have you ever spent time with someone who was so absentminded or distracted that you wondered how they got through life every day? On the other hand, have you ever known someone who was so observant and attentive that they made you feel a little self-conscious? I have been on both sides of this equation, and you probably have as well. Why? Because we all possess different levels of awareness. Individuals all vary somewhat when it comes to this ability. As we have described in previous blogs, Awareness of Surroundings is one of the four factors of SafetyDNA©. This broad Awareness factor includes various components, such as attention to detail, working memory, multi-tasking, and tendency to be distracted. Research shows that all of these abilities are related to safety outcomes such as unsafe behavior and injury involvement. As you would expect, people who have higher levels of these traits tend to notice potential hazards around them more easily and quickly than those with lower levels, allowing them greater opportunity to avoid injury. While awareness is just one of many individual, situational, and organizational factors that lead to injuries, it is a critical one. So, when is this factor most important? It depends on the job and the situation, of course. But based on some of the most common types of injuries and OSHA violations per year, here are five types of hazards that make Awareness absolutely critical on the job. Working at heights. Year after year, fall protection continues to be the most frequent OSHA violation in the U.S., and is the leading cause of fatalities in the construction industry. While personal fall arrest systems are essential, employees working at heights must always be aware of their immediate surroundings. This includes monitoring their PPE, equipment, and tools, as well the structure or environment they are working on. It is easy for anyone to become distracted while performing intricate work on a power line or installing roofing. But some individuals already tend to be distracted more easily and tend to notice less visual details, which puts them more at risk. Throw in fatigue from a long day or pressure to work quickly, and suddenly these individuals could be at a much greater risk of falling. Slip and trip hazards. Falls don’t always happen from any sort of height. Falls from same-level surfaces are the second most common type of injury, according to OSHA. We’ve all had moments when we trip over something, or slip on a slick surface, because we were hurrying. But for some, these types of incidents happen more frequently because they have difficulty noticing potential trip/slip hazards. Whether it’s the inability to consistently detect things in their peripheral vision, or their tendency to not keep their “eyes on path” because they are busy thinking about other things, some individuals are more susceptible to this type of injury. There are different ways to exhibit lower awareness – sometimes it’s not being able to see something, and sometimes it’s having the tendency to not look for something. At the end of the day, both of these result in not seeing something that can get your injured. Powered Industrial Trucks. In 2011, OSHA estimated that over 100 fatalities and over 94,000 injuries occur every year due to unsafe operation of powered industrial trucks, such as forklifts. In fact, I know of a company who had a very serious injury last year where an employee was actually crushed between two forklifts and ended up in the hospital for months. While the individual was lucky to survive, he is still out of work, has had several major surgeries, and the incident has now cost the company well over $1 million in total costs (and still counting). Why? The individual who hit him was seen on camera not even turning his head once to look behind or around him as he backed up repeatedly. Safely operating this type of equipment requires constant visual scanning and situational awareness. While anyone can be involved in an incident while operating moving equipment, what happens when an employee is inherently prone to missing important objects and visual cues in their environment? What if a forklift driver is statistically more likely to forget where objects are located in his/her immediate surroundings because he/she has somewhat lower levels of working memory compared to their co-workers? Hazard communication. The recent alignment of the OSHA Hazard Communication Standard (HCS) with the Globally Harmonized System (GHS) of Classification and Labeling of Chemicals was a great step in policy towards improving hazard communication about hazardous chemicals. However, even the most visible and intuitive labels or safety data sheets must still be seen and understood by a human being. It is still necessary for an employee to take the time to inspect a label, or to at least notice it, quickly interpret information about potential risks, and then act upon it correctly. This requires attention to detail, one of the key components of the Awareness factor in the SafetyDNA model. Employees working with hazardous chemicals must display this ability in order to stay injury free, and it will always come a bit easier for some than others. Electrical Work. One of the most dangerous workplace hazards in terms of potential consequences is working with electricity. 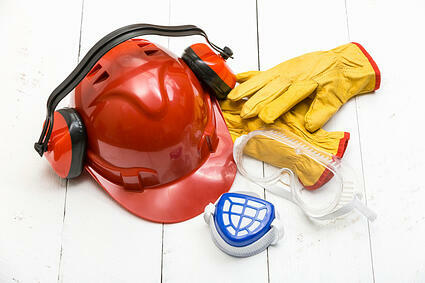 OSHA estimates that approximately 350 workers die every year in electricity-related incidents. It’s easy to see how Awareness is essential when doing work around power lines or performing any sort of electrical wiring. Workers in these types of jobs must constantly maintain awareness of various factors, such as keeping Minimum Approach Distances (MAD) from power lines, using proper ground-fault protection, and maintaining wires, tools, or extension cords in safe working condition. These hazards are compounded further in jobs where this work is done at elevated heights, requiring even further concentration and focus. Safe work practices for these working conditions are obviously trainable (as with all of these examples), but individuals with naturally lower awareness must be particularly vigilant about electrical risks and the behaviors they must use to avoid injury or death. So, what happens if you tend to be have lower awareness? Does that mean you can’t work in many of these jobs safely? No, of course not. Statistically speaking, thousands of employees work in these jobs every day successfully even though they would score lower on an assessment or test of Awareness of Surroundings. It simply means they have more personal exposure and higher probability of being injured due to this aspect of their safety profile. The nature of the job, training quality, and company safety culture will all impact this exposure level as well. However, by learning about oneself and acknowledging the fact that one may simply be prone to greater distraction or forgetfulness in certain situations, a person can easily reduce their risk by engaging in certain precautions and proactive behaviors to make up for their blind spot in awareness. Using checklists, memory aids, developing a habit of triple-checking things, or simply asking a co-worker to inspect your work or your PPE are simple ways to do this. Not everyone can spot every little detail in seconds or have ‘eyes in the back of their head.’ But everyone can know their strengths and blind spots and decide to do something about it in order to avoid harm to themselves and their co-workers.